First, an apology: I have a habit of writing about writing, instead of writing about something interesting. This first post is a perfect example of that. 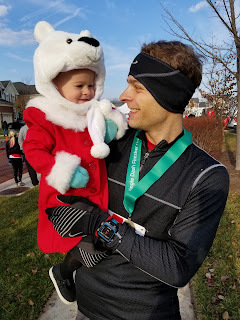 Instead of knowing that this space is a place for my musings on being a new dad and my passion for middling triathlon, you are focused solely on the meta of this post. Seeing as I've already committed to the bit, I might as well continue with it. I've wanted to write for a while, but since I haven't won any awards for my writing since a column I wrote on sporks for my high school newspaper, I just haven't found the motivation I need to put pen to paper, or I suppose in modern parlance, to put finger to molded plastic. Ironically, it was in listening to the spoken word that I felt the nudge necessary to impulse buy this domain and put something on it. Listening to a local running podcast, Pace the Nation, I've heard multiple authors interviewed about their books or essays, and gosh darn it, if they can do it, so can I.
I don't know what this blog will be, or how consistently I will write, but I do feel compelled to give you some background on myself to provide some color to these words. That's enough background to get you started, yes? Though not in this post, I do want to get into my training plan pre- and post-child, and my fears about my training (which is just one drop in the "OMG-I-am-responsible-for-another-living-being's-complete-and-total-livelihood" fear bucket). Planning is one thing, but I also want to get into the execution of those plans, how my wife has been accommodating, and how I've needed to change my expectations of what I can and cannot do, but further, what I should and should not do. My wife tells me constantly of the mommy blogs that abound on the internet, and I know there are a few daddy blogs. 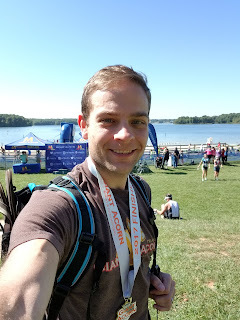 There are probably fewer still triathlon blogs, and while I haven't spent the thirty seconds it would take to fact check, this could very well be the only daddy-triathlon blog. I hope I do it justice.